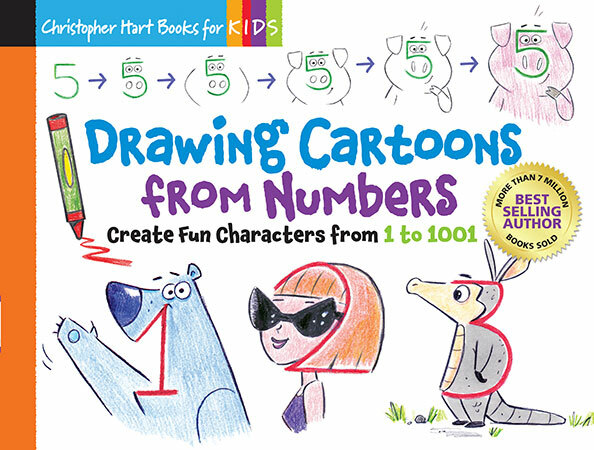 In Drawing Cartoons from Numbers, the latest addition to the hugely successful Drawing Shape by Shape series, best-selling author Christopher Hart has created his most inventive characters yet. Expanding his quirky cartooning expertise into the realm of numbers, Chris offers a wildly creative collection of cartoon characters all drawn with a simple number as the starting point. The construction of each character-shown in detailed, step-by- step instruction-is simple, however, the clever images that emerge from these common number shapes are a delight. Encompassing and combining a range of numbers from 1-1001, this book is an excellent resource for supplementing children's education in numbers and the many ways they can be used. Fans of the Drawing Shape by Shape series will instantly recognize the style of this latest addition, and will appreciate this title as a companion to Chris's previous book, Drawing Cartoons Letter by Letter. Starting with just a simple number, drawing for anyoneâ€”child or adult-can be as easy as 1, 2, 3.